A long over due update. I’ve let nearly two weeks slip by since last updating my weblog. The event most worthy of note during that period occurred over the past weekend, and that was our trip down to Arkansas. The trip itself was a bit of a nightmare on the outbound leg, a combination of bad luck with the weather and the typical bad customer service of American Airlines. Discounting the travel as a necessary evil, the trip overall was a great deal of fun. I met the part of Shana’s extended family that I had until now missed out on meeting, and was reacquainted with those that I had met before. The weather in Arkansas was a very welcome break from Toronto, with highs somewhere between 70 and 80 Fahrenheit (21-26 C). I, of course, took my camera with me. The poor Toronto weather has kept photography to a minimum recently, so I was looking forward to this opportunity to take some shots. Unfortunately the combination of rusty skills and time pressure meant that I came back with fewer good pictures than I had hoped for. If I had been alone I could have taken many more, but then the trip wasn’t intended to be a photography outing. 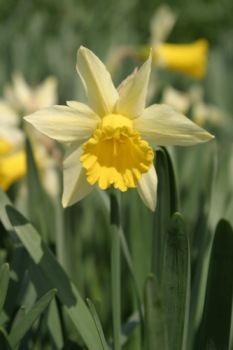 This shot of a daffodil was one of the ones that did come out, despite the flowers being well past their best. Prior to the trip to Arkansas, I had spent a good few days trying to unite the software which creates my website (PubTal) with my weblog program. I’ve done this in the form of a plugin for PubTal, which I’ll probably include in the next version I release. I can now write weblog posts in a text editor, or even OpenOffice. Posted in Uncategorized | Comments Off on A long over due update.